A soup and another award nomination! The wonderful summer break is about to come to a close after weeks of sun and surf, boating and seafood, and fun times with friends. The kids return to school next Wednesday, and I dread the return to routine (although it’s a pretty shoddy semblance of routine that’s followed in our house!) that must come with the return to reality. But it has been a lovely start to the year. Adding to my sense of well being receiving another nomination for blog award! Always very exciting and validating. It’s a funny thing, but each award nomination I have received has come while I have been having fun at the coast. I must go down there more often…! Because this is actually my second time nominated for the Versatile Blogger award, I thought that rather than formally accept it, I would like to share some thoughts on the blog / blogger who nominated me. The nomination came from Feed the piglet… . I have followed this blog for some time now. I have to confess that I started to follow it because I couldn’t resist the name, but there are lots of lovely and healthy recipes to be found, entertaining tales and really fabulous photos. I go to this blog often when I am seeking inspiration. The recipes are generally easy with ingredients that you have to hand or are easy to obtain, but often have something a bit different in them – some unusual or unexpected combinations of flavours. I have added a number of his recipes to my ‘must make’ list – next is the Eggplant and Mushroom Pate, which looks mouth wateringly good. 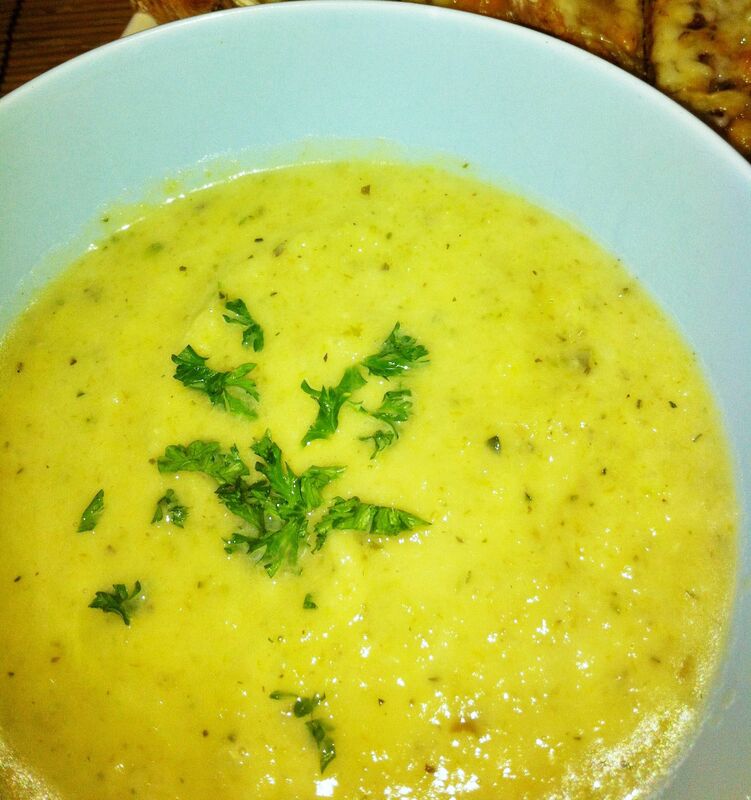 The other day I made the Leek and Parsley soup (version 2), and it was delicious. What really grabbed me was the idea of combining the soup with melted brie on toast. Saute the leeks, potatoes and celery for about 15 minutes on a low heat, then turn heat up to medium. Add zucchini and cook for another 5 minutes. Add water, stock cubes, chilli, bay leaf and about half the parsley. Bring to the boil, and cook until all vegetables are fully cooked. Remove from heat. Take bay leaf out and blend the soup til smooth. Taste to see if any salt or additional parsley are required. Blend again if necessary, and return to pan. Re-heat to serve. Add the cream to thin the soup if necessary – the cream is optional, it tastes lovely without too. I served with the brie on toasted ciabatta and the combination was magic! So thank you to Feed the piglet, for the nomination and the inspiration! 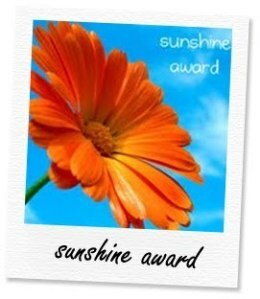 I am very excited that I have been nominated for the Sunshine Award! 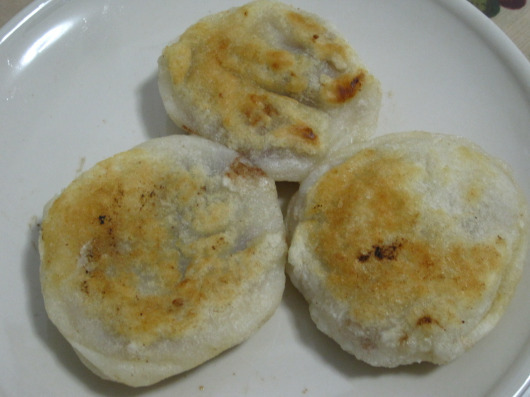 Thank you to http://createengwp.wordpress.com for nominating me (and check out the recipe for Red Bean Paste Pancakes – http://createengwp.wordpress.com/2012/11/07/red-bean-paste-pancake-recipe/ – they look SO good!). My son asks me this question every day, and every day my answer is different. Today I am thinking tiger. 6. What is your favourite physical activity? 7. What is your favourite non-alcoholic drink? Another one that might change from day to day. Thinking right now about gerberas and tulips, and all those gorgeous jacaranda blooms enveloping my back porch. So many passions: family, cooking, reading, writing, gardening, music, craft, and suddenly, watching lots of soccer. I arrived down south with the sprogs a few days ago, but without my mobile internet stick. Horror! Even being down here away from it all I couldn’t dispel that niggling sense of unease that comes with being disconnected. I’m not super geekie or into all things network, but I do need to have my daily hit of blogging, emailing and generalised surfing. Kind of like my morning coffee… So when Wal arrived, connectivity in hand, I couldn’t wait to fire up the laptop. It was a very exciting and lovely surprise to be greeted with the Versatile Bloggers award! Thank you to Carla Sue from eat sweet! I love boats: afternoons of food, wine and spectacular views out on the water. What could be a better way to spend a day? 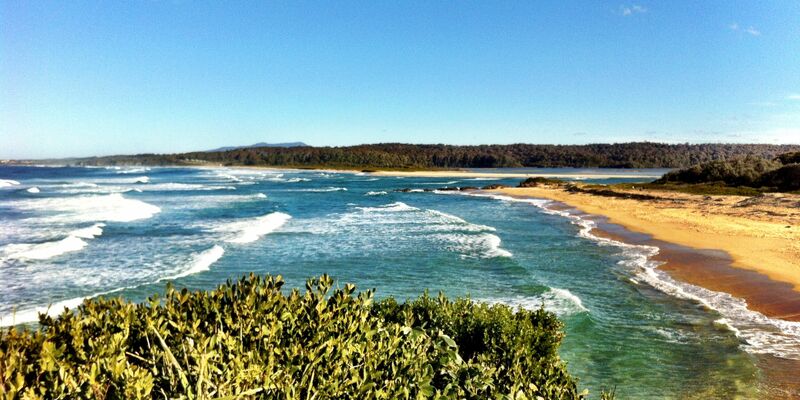 I love the south coast of New South Wales. I love and devour books and magazines – about anything: fiction, biographies, cookbooks, gardening, craft, nature, boating, birds, etc. etc. Another part of getting this award is that I get to nominate 15 other blogs for this award too! Here is my list – and if you would like to nominate this award to some of your favourite blogs, please do! (see the rules for the Versatile Blogger Award at the end of the post). Congratulations on your great blogs!